I've got a few things to share with you, just cos I find them cool, fun, or silly! 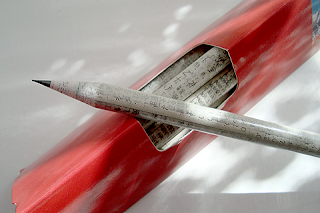 Cool : Mandarin Square pencils made with tightly rolled Chinese newspaper. They sharpen well with a normal pencil sharpener, and it's saving trees! You can get them from Pepe's Paperie (Canberra, Sydney, Melbourne, Adelaide). $7.95 for 10 pencils. Fun : this is the outfit I'll be making for Dotter in upcoming months for her Year 12 Prom Formal in November (Bells is quite right, it's a formal, not a prom, my American upbringing sneaking in there!). She's a Jazzy Girl! Simplicity pattern 3629. It's a dress (white top with coloured skirt sewn together) and a long fitted vest over the top. Plus the cute little colllar and tie. Fishnet stockings, crazy shoes, white wig, and black hat to complete the ensemble - you know my girl, never one to shy away from the spotlight! 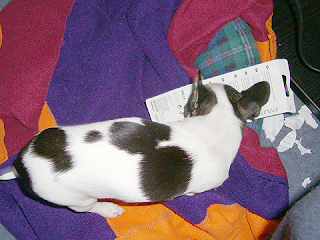 Silly : Petal loves to rip up paper (my very own shredding machine!) 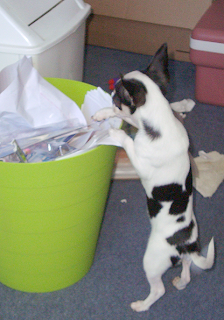 - last week I caught her selecting her victim from my recycled paper bin, and then going in for the attack! Cool : I discovered these awesome Keepeez lids at Howard's Storage World last week. They're designed to replace plastic wrap for covering bowls / mugs / whatever. They're made from a very durable clear film, with a rigid plastic rim. 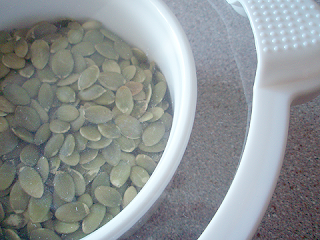 You simply pop it onto a bowl (with a clean and smooth rim), and press down in the middle to push air out, and voila, it stays put! 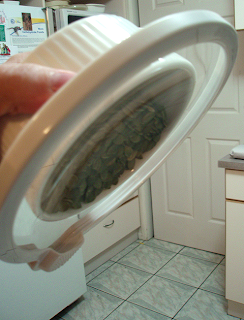 Dishwasher, fridge, freezer safe, and can be used in the microwave for low temp things (not boiling liquids). I only got a little one to start with ($10.99 for 15 cm/ 6"), but I'm keen to get a 60 cm one to fit over my main big mixing bowls - I often make bran loaf which has to soak overnight, and I'd much prefer to use a reusable cover rather than foil or plastic wrap! Cool : this photo just won a competition over at Electric Firefly! 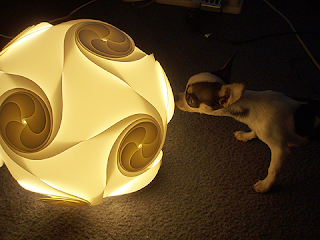 This is one of their gorgeous (30-50% recycled) plastic lamps (Nimbus), which I got at the OBDM earlier this year, being investigated by Petal. I won a new lamp, and chose an Orbital. This photo is now in their Product Gallery! The guys will be at the Old Bus Depot Markets (OBDM) this Sunday (16 August) if you want to check out their fantastic lamps in person. Fun : Not just fun, but also important - Operation Beautiful. Leave positive post-it notes in public places (bathroom mirrors, inside a book, wherever) ... fantastic idea. Something Dotter and I will both be getting involved with! Next post is #500, and the big competition! Stay tuned! I think that operation beautiful was what I saw at the university this winter semester - someone had written "you are beautiful" on a ton of windows - but without the website. I wish I had remembered to take a picture of it. I love the idea. Very cool! Love all these things!! those pencils look very cool. I thought at first that was a per pencil cost but for 10? That's great! Love the lids. Must look them up. Well done on the contest! I can see why you won! And do the kids not say formal anymore? Do we say prom like America now? Wow, how things change. My son brought a Chinese newspaper pencil home from school and I thought that was the coolest thing! Aww, I love the photo of Petal and the lamp, too! What a cool lamp. And a great photo. You are one talented woman. I made the dresses for my girls' formals, proms, whatever. When I was in high school, kids went as couples and girls had to wait to be asked. Now, the kids all go regardless of whether they have dates. I think it's better for the ego. Chloe does that paper shredding thing too - and usually at the same time of day in the evening when she wants to play. Interesting stuff you're featuring - that outfit suits your dotter to a "t' ... and I love that "you are beautiful" post it notes project. the picture is beautiful and the outfit is fabulous! Dotter rocks, Petal rips, and you, my dear, are beautiful! Cool photo!! I want your dog!! Just planning on coming over to Aussie and kidnapping her! Beaut pencils! I love the look of them. I reckon they'd feel nice in your hand as you write too. Congratulation on the photo win! You must have been so happy! Thanks for the heads up on the lids. I have been looking for a replacement for plastic wrap for some time. 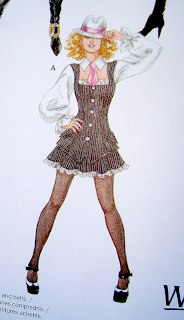 Tell dotter to wear the fishnets over regular pantyhose or stockings. That way the fishnets won't eat her toes in her high heels. Also, tell her to have fun!